Dangerous foods for dogs include chocolate. At best she'll have stomach issues, at worst it could kill her. We accidentally left chocolate out when we went out one time, and Holly ate all of it. Fortunately, she never got sick. We were lucky she didn't. And, we made sure we never left chocolate out again. Dogs love food, and it's hard to resist something as yummy as candy! Foods high in fat should not be given to your dog as it will cause stomach distress. 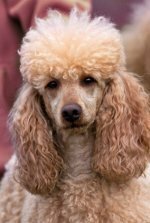 Your poodle should not be fed spicy foods, onions or raw eggs. Raw eggs always carry the possibility of salmonella. Do not give your poodle pork, chicken and turkey bones. They can puncture her intestines. If you must give her a bone, choose a large bone such as a marrowbone. Boil it to kill bacteria. And make sure she doesn't swallow any. Chew toy bones are a much better and safer alternative. Gravy, coffee, tea, raisins, alcohol and grapes can cause gastrointestinal upset as well as other problems. It's best not to give these foods to your poodle. Alcohol can cause alcohol poisoning which can be fatal. Coffee and tea contain the same dangerous chocolate ingredient, theobromine. Grapes and raisins can cause renal failure which can start with vomiting, diarrhea and lethargy. Call your vet immediately if you notice any of those symptoms and your poodle ate any of those foods. 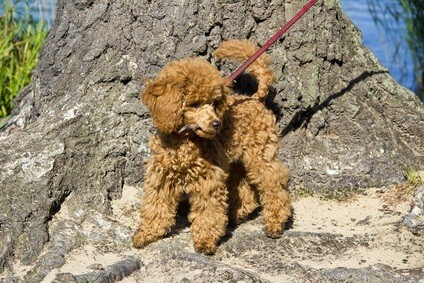 Macadamia nuts can cause back leg paralysis in your dog. This usually goes away in about 3 days. The artificial sweetener, Xyitol, can cause your poodle's blood sugar to drop quickly and result in loss of coordination and seizures. Stay away from dogs and chocolate, dogs and onions, and dogs and bones. Those do not mix well with poodles. 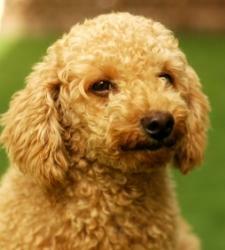 You want your poodle to be healthy, so be proactive on the foods that you feed to your dog.